Spillway Dam, looking upstream, under construction. June 19, 1916. With spring runoff starting, winter floods behind us, and a record drenching March, as you walk over the locks, some of you may wonder where does all this water come from and how does the Corps of Engineers know how much to release or keep. 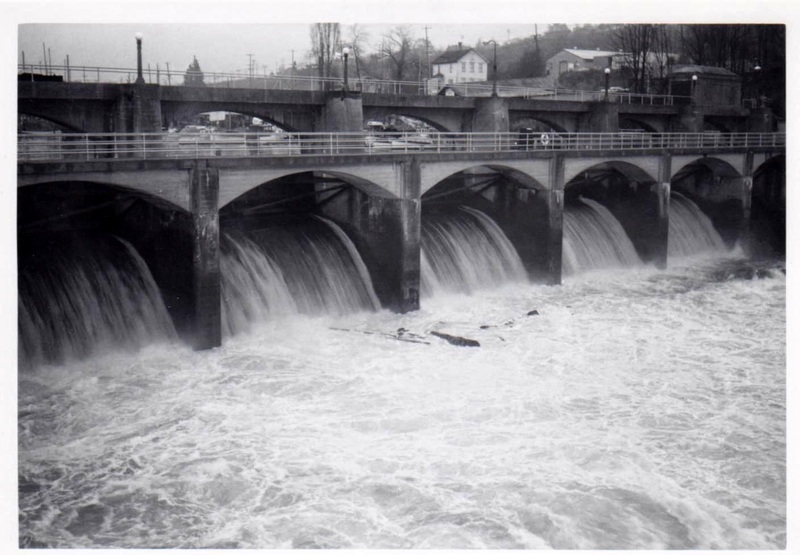 The water that leaves through the lock chambers, races under the tainter gates, or gushes through the fish ladder at the Hiram M. Chittenden locks has had a long journey by the time it hits the Puget Sound. Most of the water starts out as snow high in the Cascade Mountains slowly working its way down, over waterfalls, through turbines, meandering down a river, and then hanging out in Seattle before finally meeting the ocean. In this article we will take a brief look at the history of what role the locks has had on the watershed that drains through Salmon Bay and how and who manages the water levels. changes between lakes Washington and Sammamish. Section of scroll showing elevation changes. By the time the water touches the locks, it has had a lengthy journey. Much of the water you see at the locks starts out as snow on the Cascade crest. As the snow melts, it flows down into Chester Morse Lake and from there flows over the Masonry Dam into the Cedar River or through the penstocks to Seattle City Light’s 109 year old Cedar River hydroelectric powerhouse. The water continues on, passing the Landsburg diversion dam—where the City of Seattle diverts some of the water to supply a large chunk of its drinking water—eventually reaching Renton where it passes under the Renton public library, then past the Boeing Renton plant, and finally into Lake Washington. After making its way through the features of the Lake Washington Ship Canal, including the Montlake and Fremont Cuts, the water emerges into Salmon Bay finally reaching the locks. The water levels maintained by the locks are provided for by the project’s authorization. 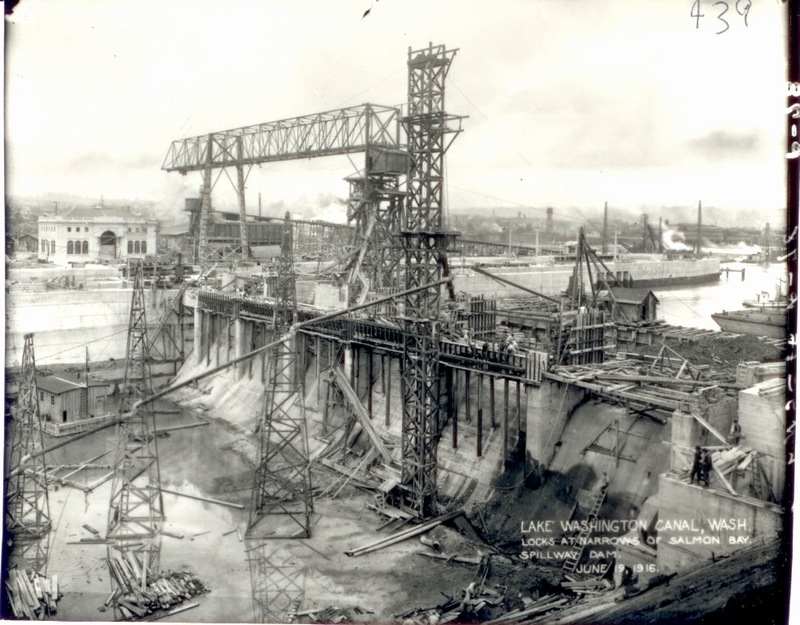 The documents state that under normal operation the Lake Washington Ship Canal should be maintained near the pre-project level of Lake Union with an allowance for 1 foot above or below that level for seasonal and lock usage variations. This translates to a 2-foot range between 20.0 feet and 22.0 feet respectively. During the winter, given the precipitation we receive, maintaining the 20 foot level is not a problem. The water level is kept at the 20 foot level during the wet winter months so as to reduce shoreline erosion from stormy winter weather. In mid-February however, the tainter gates are lowered and begin releasing only lesser amounts of water. The eventual goal is to have a water level of 22 feet by May 1st. The Corps manages water through the summer in order to maintain vessel traffic, as well as flows for adult salmon in the fish ladder and for juvenile salmon in the smolt slides. In the autumn season, the water is drawn down to 20 feet again. Throughout the year then, and in particular during the summer, the Corps managers—both at the locks and at the District office—have to pay close attention to how much water is being discharged. Discharging water at the locks can happen in one of five ways. First, the water can leave through the lock chambers. After being converted into a constant flow, the large and small locks combined, discharge a flow of approximately 130 cubic feet per second (CFS) in an average month. Second, the salt water return flow of 160 cfs is almost always used to supply the fish ladder. Additional discharge through the salt water return however is rare. Third, as a standalone discharge source, the fish ladder accounts for only 23 CFS in an average month. Since 1999 the fourth primary discharge source has been the smolt slides. The slides allow for juvenile Salmon to get past the dam with a higher chance of survival and are typically operated from April 15th through mid-August. The Corps can operate none or all four of the smolt slides given the time of day and water constraints. When all four of the slides are open however, the discharge rate averages 400 CFS per month. Finally, the fifth discharge source is the six tainter gates. The tainter gates allow for adjustments and fine tuning of the water levels in order to maintain the 20 to 22 foot. 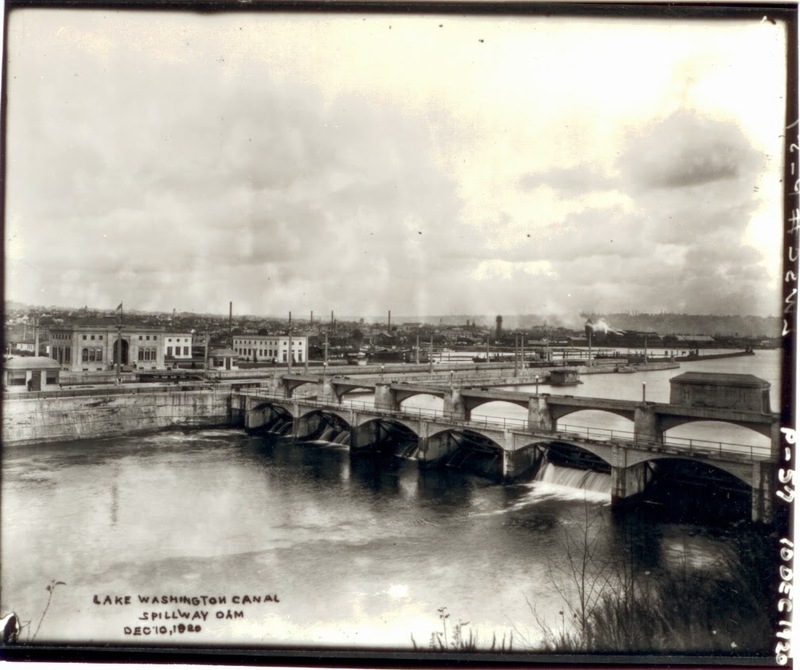 Not much has changed to the dam since 1916 when this photo was taken. Even the soon to be replaced tainter gates are the originals. Beginning in February, when the Corps begins the process of raising the water level to its eventual 22 feet, the operators in the control tower are provided with a daily target from the water managers at the District office in downtown Seattle. The operators have both the target water level for that day, and real time data, to the 100th of a foot, showing the actual water levels at the dam. Based on any differences between the current and targeted water level, the operators can make adjustments. If for example, the water level is above the target, the operator on duty can push a button—one for each tainter gate—and raise the gate to allow for water to be released. Later, the operator can check the real time data to see if the adjustments they made brought the water level back into line with the target. Conversely, if the water level was too low, the operator would lower the gates. Each of the gates can be moved in six inch increments and has a maximum opening of 7 feet. Each increase of six inches, per gate, equates to a 200 CFS increase in water discharge. Additionally, if all 6 tainter gates were fully open, during the summer months when the water level is 22 feet, they would release almost 18000 CFS. While having the gates wide open might be a necessity in the fall and winter, during the summer months, water conservation and maintaining the 22 foot water level are the primary goals. Even though the target is to maintain the water level at 22 foot as far into summer as possible, the water level in reality typically begins dropping by late June. Beginning in late May and early June, the Corps will begin planning and making determinations about to much water to conserve. If the water level begins to drop more than expected the Corps can begin taking other steps. These steps could involve reducing lockages or reducing the amount of water being run through the smolt slides. If the water levels continue drop, the locks could further restrict lockages, by consolidating boat traffic, reduce the flow to the fish ladder, and further reduce the salt water return flow. In the worst case drought scenario, where the water level drops below 20 feet, the Corps could include restricting lockages for both commercial and recreational vessels, and intermittingly turn off the flow to the fish ladders. Luckily, in recent history, only once in 1987, have such drastic measures had to be taken. Most years the advance planning done in early summer allows for the locks to avoid restrictions and for plenty of water to be available for salmon. Finally, the water levels at the locks are not managed in isolation. In fact, the Army Corps of Engineers coordinates with the In-Stream Flow Commission (IFC) chaired by the City of Seattle. The commission is an inter-agency group tasked with managing the water that comes out of the Cedar River and meets monthly to discuss issues related to the implementation of the city of Seattle’s Habitat Conservation Plan. As this relates to the management of water levels at the locks, the IFC typically advocates for the smolt slides to stay in as long as possible and that the fish ladder always be receiving the necessary water flow. To learn more about the operations of the locks, and to see the almost 100 year old tainter gates being replaced, come visit the locks! A special thanks to Marian Valentine, Operations Project Manager at the Hiram M. Chittenden locks, for speaking with me and providing information from key U.S. Army Corps of Engineers documents.